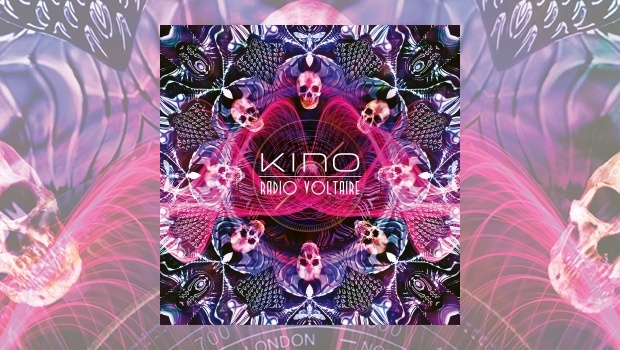 Kino’s Picture was my favourite album of 2005. In fact, I would easily say, without looking, that it was one of my favourite albums of the first decade of the 2000s. Despite wanting to hear a follow up… none came, however the band did finally get together during the summer of 2017 to write their first album in over 13 years, Radio Voltaire, now released. Any album, after a thirteen-year hiatus, will be both greatly anticipated and overwhelmingly appreciated and Radio Voltaire‘s first single, The Dead Club, was bombastically wonderful to hear after so many years. It had the same feeling of some of Frost*’s earlier surprises, and was an early favourite from the album it still maintains its celebrity. But the true heroes of this album are Idlewild and Warmth Of The Sun, but more on those two later. With cover artwork designed by Paul Tippett, the album opens with radio interference before the title track begins, and although this track kicks things off well, I personally think they should have opened with The Dead Club. Radio Voltaire starts off slowly, with that wild electric guitar intro, before the melodically slower music and vocal delivery take over. A good song, but a slow opener. The Dead Club is the second track and one of the best songs in this collection. It charts a new course for the band and takes no prisoners, hellaciously racing electric guitars opening the sound, which just rips at your ears, as the deep bass and drums try to reassure. The melodies and harmonies are electric and at another level, comparable to the first album. Record setting pace and power. Idlewild is next, in a tie for the best song on the album, it takes me back to the passion and emotion the first album brought for me. I can admit that some of the more emotional tracks on Picture brought me to tears back then. All You See, Picture and Holding On still bring back wonderful memories and chills to this day. When I heard Idlewild for the first time, it was like going back again. That piano also reminded me of some of the work of German band Sylvan, another emotionally strong progressive rock band. This is another of those great English progressive rock songs which will last forever, like a good ol’ Fish era Marillion track, one that you will never be able to let go of. I Don’t Know Why opens as one of the heavier tracks, much heavier than the debut. It’s a good song but sounds too much like other English bands of this genre. In contrast I Won’t Break So Easily Any More is another of the powerful emotionally charged tracks, opening with fatherly advice narrated to sympathetic guitars and keys. The opening tugs at the heartstrings, but then the pace picks up and the band turns it into a Rocky-like anthem, fighting against all those who would put us down. John Beck’s best keyboard work can be witnessed later in the track as he even pulls out some Tony Banks’ The Raven-era inspiration on synthesizers. By way of contrast, Temple Tudor opens with acoustic guitar, a nice touch after all the electric music which has preceded it. Mitchell’s vocals have deepened over the years, but he still, clearly, has one of the best voices in U.K. prog. The lyrics read as a commentary on the changes that have occurred in the U.K. in recent years, the powerful way they work taking me to of one my favourite hymns, created from the William Blake poem, Jerusalem. Moving on, Grey Shapes On Concrete is another heavy song full of loud electric guitar, heavy bass, eerie keyboards, and the best drumming on the album. The song does however sound a little like some of the less memorable tracks from Picture, whereas Keep The Faith offers another deep lyrical plunge of emotion and guiding words of wisdom. Don’t give up: “Dust to dust and back, we will return”. Another great track closes the album – this band know how to close an album well. On Picture they saved the title track for the end, on Radio Voltaire it’s The Silent Fighter Pilot, like an ode to the pilot sequence from the 2017 movie Dunkirk, this song is full of emotion with wonderful peaceful keys, great lyrics and excellent music. Since I purchased the deluxe edition, I will add the following regarding the bonus tracks. Temple Tudor (Piano Mix) features more solo piano instead of acoustic guitar, and is a worthy addition. The Dead Club (Berlin Headquarters Mix) may be even better than the original, with very cool keyboard work. There are more keyboards than guitar on this version. Keep the Faith (Orchestral Mix) – as the title suggests – includes more woodwinds, brass, bass and piano. Finally, The Kino Funfair is an original and fun addition with lots of wonderful keyboard work. Kino’s version of a Danny Elfman parade theme. This is going to be one of the best albums of the year for me. The minute I heard about it I knew I would both want to buy it and review it. If you liked the first album, please go and buy this. Hopefully there will be more… and not thirteen years down the road. Formats: Ltd.Ed. CD Digipak (including bonus tracks), Gatefold 180g Double Vinyl (incl. CD), Digital Download.